The end of an era. It's 1969. The Seddons works have been out of production for two years, but are still largely intact. The Trent & Mersey Canal has reached the end of its life as a commercial carrier and, for the moment, all is quiet and tranquil. The Wych House Lane Works (right) will be demolished and (eventually) give way to a lawned area below the Salinae centre, filled with market stalls and amusements come festival time. The Brooks Lane works in the far distance will become the home of Tarmac Readycrete and the only one of the Seddons premises to remain recognisable as a former salt works. The canal is already being used for pleasure boating, and this will increase over the years until there are far more pleasure boats than there ever were working boats. This photo was first published on Facebook on 22nd May 2011. The original Facebook feedback is below. Dave Roberts Beyond the Wych House Lane works on the right was the remains of another, earlier, salt works. My Dad took me to see it when I was a small child and one of its chimneys was still standing. This area is now the premises of Andersen Boats. Jonathan Williams It's amazing, given the heavy industry of the past, just how rural the aspect of this stretch of the cut appears today. Who'd have ever expected a wildflower meadow and nature trail in the middle of the Flight of Three locks? Dave Roberts Yes. indeed. It's a credit to everyone who's worked so hard to make this town so pleasant. A walk into town via the towpaths is a pleasure these days. Dave Roberts ‎...of course, you'll always get some people who think these things just happen of their own accord, and aren't planned and discussed and worked on for a long time before they come to fruition. Colin, you may be right. It's a very long time ago now, but I seem to remember that the chimney we saw was round, unlike any other salt works chimneys I've ever seen. And on the other side of the canal (adjacent to Seddon's Works) there was a lime bed, similar to the ones in Booth Lane which may have been associated with the works you mention. 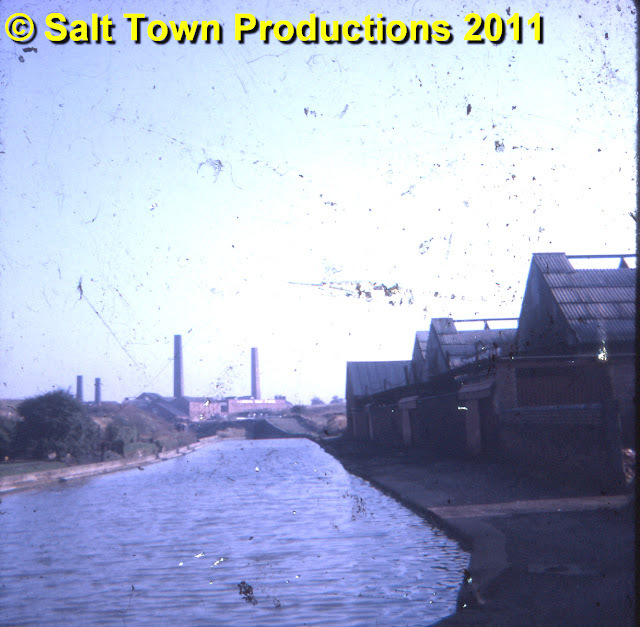 THere's no reason why a chemical works couldn't have been built on both sides of the canal. Colin Derek Appleton He did mention that, if its the same one it was on the land that is now owned by the Devaneys ? Dave Roberts I wonder if there was any specific reason why Salt Works chimneys were always square? I've seen photos of open pan works in Stafford, Runcorn, and , of course, Winsford and I've yet to see one that wasn't square. Was it, perhaps, to do with avoiding the effects of subsidence? Dave Roberts ‎...and yes, the lime bed we're talking about was indeed on the land where Devaney's Sawmill was.